Michael Jackson's latest greatest hits album has sold just 8,000 copies in the US in its first week of release, reaching number 128 in the chart. The Essential Michael Jackson is the star's first release since he was cleared of child abuse a month ago. 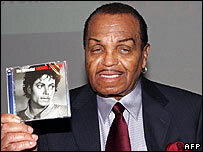 Jackson's two-disc set went straight to number two in the UK - but he failed to match that success in his home country. The number one US album, multi-artist compilation CD Now 19, sold 436,000 copies in its first week. Jackson faces a struggle to repair his image and repay debts that prosecutors in his trial claimed amounted to $300m (£170m). British public relations supremo Max Clifford has revealed he turned down a request to represent the singer after his trial. "He came to me a month ago and I turned him down," Mr Clifford said. "It would be the hardest job in PR after Saddam Hussein and I would be astounded if he could turn things around. "People were extremely offended by even some of the things he admitted in court. The Essential Michael Jackson is the latest in a string of greatest hits packages that has also included HIStory, Number Ones and The Ultimate Collection.